Residents in Vila Autódromo protest the destruction of their neighbourhood (Photo: Margit Ystanes). The directors of the project documentary Dirty Games: Olympic Evictions in Rio de Janeiro, Margit Ystanes and José Alejandro Huidobro Goya, are available for screenings with Q&A sessions at schools, universities and public debate events. Please contact margit.ystanes@uib.no for more information. This documentary follows residents in Vila Autódromo, a neighbourhood in Rio de Janeiro that was decimated as the city prepared to host the 2016 Olympics. The film explores what it was like to live in Vila Autódromo as houses were demolished, how residents remember life there prior to the evictions, and how they mobilised to preserve their neighbourhood. 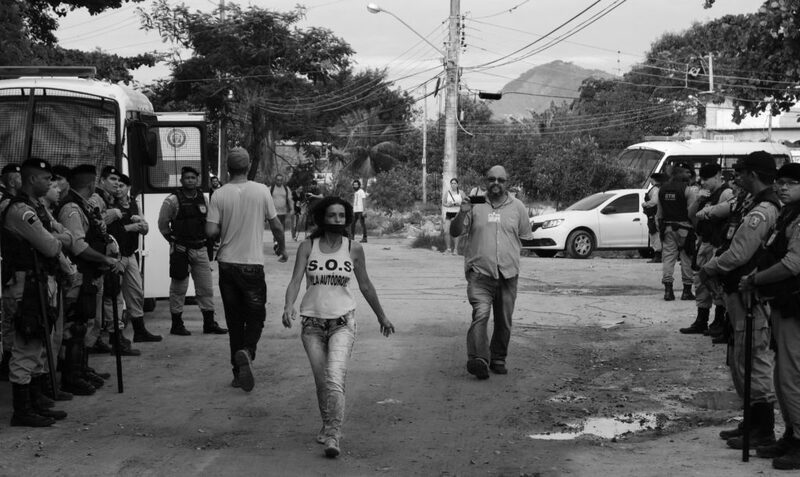 Working together with local and international activists, journalists, researchers and filmmakers, the residents succeeded in catapulting their struggle to remain in Vila Autódromo onto the world stage. The film also examines the context for these events; the Olympics as a vehicle for urban development, corruption, inequality and global trends prioritising profit rather than human needs in the use of land. The most important question explored in the film, however, is why the resistance to leave Vila Autódromo was so strong. What is lost when people’s homes and neighbourhoods are destroyed? Dirty Games: Olympic Evictions in Rio de Janeiro is part of the research project Trust as a Precondition for Socio-Economic Development: What can We Learn from the Case of Brazil?, financed by the Research Council of Norway’s SAMKUL programme (Cultural conditions underlying social change). It is co-directed by José Alejandro Huidobro Goya and Margit Ystanes. 6 December 2017 at 08:15 and 13:40: School screenings with Q&A at Amalie Skram Videregående Skole, Bergen. 27 November 2017 at 18:00: Screening with Q&A at Salve Regina University, Bazarsky Lecture Hall, Newport, Rhode Island, USA. 23 November 2017 at 14:15 – 15:30: Department seminar at the Department of Social Anthropology, University of Bergen, Fosswinckels gate 6, 8th floor. 15 November 2017 at 19:00 – 21:00: Night Snack with SAIH: Olympic Evictions in Rio de Janeiro, at Det Akademiske Kvarter, Olav Kyrres gate 49, Bergen. 8 November 2017 at 19:00 – 21:00: Screening with Q&A at Café Mestizo, Dronningensgate 69, Kristiansand. 7 November 2017 at 13:00: School screening with Q&A at Tangen Videregående Skole, Kristiansand. 14 September 2017 at 14:15 – 16:00: Screening with Q&A for students at the Department of Social Anthropology, University of Bergen. 7 September 2017 at 19:00 – 22:00: Premiere screening and panel debate at Café Sanaa, Kaigaten 22, Bergen.